Listening to the Ocean on a Shore of Gypsum Sand is a collaborative project between Gene Kogan, Phillip Stearns, and Dan Tesene. Seashells are 3d printed from algorithmically generated forms for the sole purpose of listening to the “ocean”. The project questions the role of experience in the mediation of the virtual world to the real world and visa versa. For those of us who have had the experience of listening to the sound of the ocean in actual seashells, it is a questions of lived experience shaping an approach, not only to the object (or world) at hand, but how it is perceived and acted upon. Are we to trust these shells? Do we seek out natural shells for comparison? To those for whom their first experience of listening to the “ocean” through the digitally produced shell, the question becomes one of how the first encounter with a virtualized and simulated reality shapes the experience of lived space. This virtual shell is all I know of the real, until I encounter those found in nature—and when I see this natural shell, what then is my experience of? More broadly, how does mediated reality form our preconceptions of the world? For some, these questions seem obvious—we may even have convinced ourselves that we have this all figured out. We are aware of the possibility that the virtual world and real world are two interacting identities, distinct ideas that maintain their individuality despite their mutual influence on one another. There is, however, a possibility that this distinction is fading with younger generations, as technologically mediated experiences permeate childhood. I wonder about the effect of this as they grown into the world. 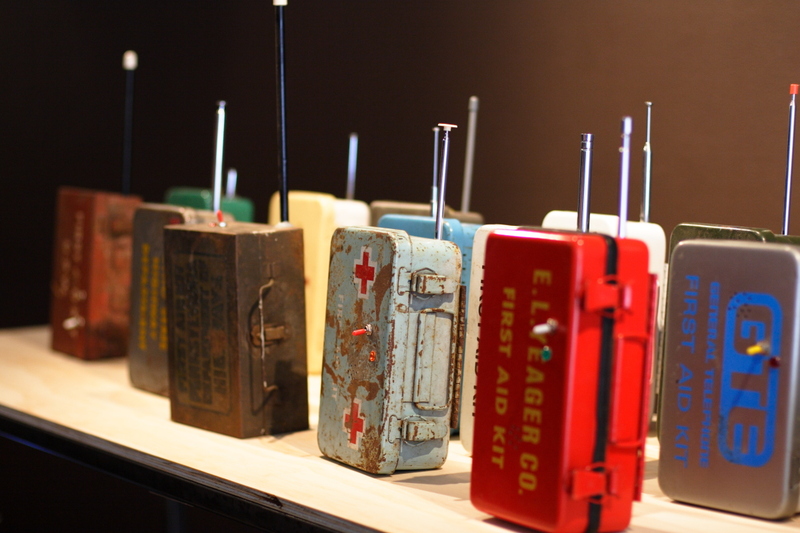 This project will be on view at Soundwalk 2012, a sound art festival in Long Beach, CA on September 1st 6-10pm. I’ll be showing Deluge, a light and sound sculpture consists of 35 hand made modules, each containing a transistor receiver that generates white noise, an amplifier w/ speaker, and 12 LEDs. Static from a broad spectrum of unused radio frequencies is gently amplified through a small speaker, and visualized by a string of LEDs. Together the cloud of individual modules create the impression of rain. Year of the Glitch is a 366 day project aimed at exploring various manifestations of glitches (intentional and unintentional) produced by electronic systems. These images are not of broken things, but the unlocking of other worlds latent in the technologies with which we surround ourselves. Maker Faire 2011 in NYC is chock full of some amazing projects. The sheer quantity and variety of makers showcasing work is staggering. To see everything is definitely more than a two day affair. This year I was invited to present a self-built solar powered music making system for 3rd Ward, where I currently teach the art of making DIY Synthesizers and small scale solar charging systems. This solar music making station (Protochiptune Project) is powered by a Voltaic Systems 15 Watt panel connected to a 7.5Ah 12V Seal Lead Acid Battery. A 10A solar charge controller does all the power management to drive the music synthesizer’s three 5 Watt amplifiers. The microchips used are from the 4000 series CMOS digital logic family, including such chips as: hex inverting buffer (40106), 12-bit binary counter (4040), 8-to-1 selector switch (4051), quad 2-input AND gate (4081), and divide by n counter (4018). These chips are used together to produce a range of pitches and rhythms that can be sequenced or programmed by moving jumper cables on the breadboard, making a mini patchable modular synth. At Maker Faire, kids were really attracted to the crazy jams coming out of this thing. Those who were bold enough were allowed to move some of the jumpers around on the board and make up their own musical patterns. Grayson Bagwell recently inspired me to begin working with prepared scanners. After taking apart an HP F335 all in one printer scanner combo, I got the bright idea to replicate some of my favorite op-art-esque images produced with the Kodak digital cameras in the DCP Series. 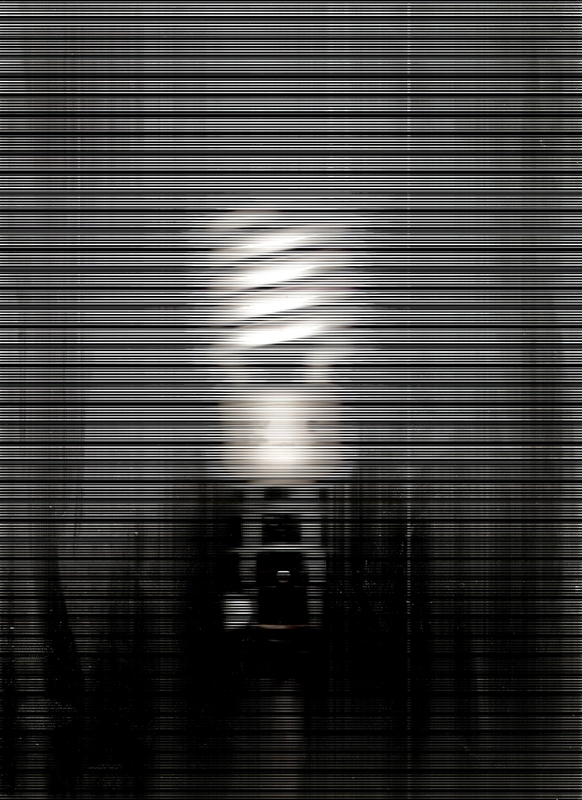 The image above was created by scanning a CFL bulb that was being controlled by audio signals generated by mixer feedback.